Also known as dental prophylaxis or a dental “prophy” and a “scale and polish” professional dental treatment incorporates a methodical examination, tooth cleaning, tooth polishing and charting process. 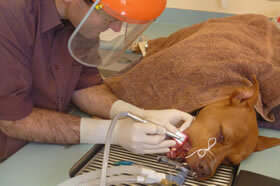 If done thoroughly it can reverse early periodontal disease and significantly reduce the chances of dental extractions. 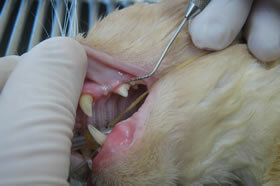 Dental Examination: Each tooth is assessed for gingivitis and tartar index, periodontal pockets, resorptive lesions in cats and whether fractures are present (which may have exposed the pulp cavity). Dental Cleaning: Prior to cleaning we irrigate the dental surfaces and gingival tissue with a chlorhexidine gluconate (antibacterial) solution. This greatly reduces the number of bacteria in the mouth and decreases the number capable of entering the bloodstream during the dental treatment and the number of bacterial aerosolised so we are kept safe too! It is vital to ensure all plaque (soft fuzzy material) and mineralised tartar is removed from tooth surfaces above and below the gum line. Any material that remains on the tooth provides an anchor point for early reformation of plaque and tartar. 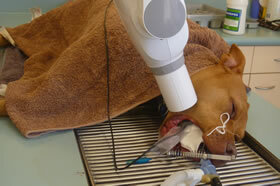 At Halifax we have state of the art equipment that allows us to safely use an electronic subgingival (below the gum) scaler that increases the efficiency of the cleaning process, reducing anaesthetic times and safety for your pet. Polishing: After the teeth are thoroughly cleaned it is very important to smooth tooth surfaces so that it is more difficult for bacteria and food debri to cling to the teeth. This slows down the reformation of plaque and tartar. Our new iM3 dental unit has a dedicated slow speed hand piece that allows safe polishing without the tooth heating up and causing damage. Irrigation: During the cleaning and polishing process diseased tissue, plaque, pieces or tartar, blood and polishing paste can be pushed up into the gingival sulcus. Left there, this creates irritation and can lead to infection and damage of the periodontal tissue. Copious irrigation is the key to removing this debri. Water is used initially the followed up by another lavage with chlorhexidine gluconate. Post cleaning examination and diagnostics. 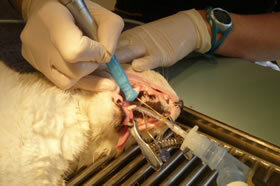 After cleaning, teeth are examined individually via periodontal probing, compressed air application to the gingiva to examine for retained calculus and radiology (if indicated). Charting: At the completion of the professional dental treatment we record all the important facts about your pets oral health including gingivitis index, areas of periodontal pocketing that need addressing with home care strategies. We attach any copies of dental radiographs so we can show you why teeth needed to be extracted or areas that may require follow radiographs to monitor success of home care. 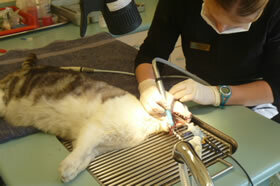 Regular follow up appointments may need to be booked to ensure successful outcomes for your pets oral health.